Crimson Trace began business in the backroom of a machine shop in 1994. In the days that followed, customers sent their GLOCK® pistols in for machining, wiring and installation of an embedded laser diode. Those laser sights continue to be serviced today—a strong commitment to the many loyal customers. This week, those years in business equals 25—a quarter century. Cordova Outdoors' lineup of premium-performance coolers and accessories is available at the 2019 Pacific Northwest Sportsmen's Show going on now. The PNSS show is the largest consumer outdoor show west of the Mississippi and the second largest in the nation. The Lyman Brass Smith 500 Metal Reloading Scale is built on a sturdy aluminum body. The beam is double sided and the pan has handles for right- and left-handed users. Med-Eng, LLC announced it has been awarded a four-year contract to supply the U.S. Army with its 2nd generation Advanced Bomb Suit to protect front line soldiers conducting Explosive Ordnance Disposal operations. Med-Eng, LLC is a company of The Safariland Group. The Taurus TX22 .22LR semi-auto pistol is now shipping to dealers across the country. This full-size, 16-shot polymer handgun is made to maximize fit, function, and comfort for shooters of all statures and levels of experience. TAC SHIELD offers two new tactical slings to their proven line of products: the Tactical 2-Point Web Loop Sling and the Tactical 2-Point QD Sling, both with quick adjust. Samson Manufacturing released their new SOPROD Cleaning Rod accessory at the SHOT Show. The SOPROD (Patent Pending) returns gun-mounted solid cleaning rod capabilities to firearms equipped with stocks featuring battery compartments. ERGO had an amazing time at the Mid-States Winter Rendezvous last week. Mid-States members own 700 of the largest farm, ranch, & home supply stores in 33 states and 4 Canadian provinces. The Second Amendment Foundation joined several other organizations in a lawsuit against New Jersey Attorney General Gurbir Grewal, seeking a temporary restraining order and preliminary injunction against enforcement of a 2018 law that criminalizes distribution of digital instructions that may be used to produce a firearm with a three-dimensional printer. National Police Ammunition announced that the prestigious Miami-Dade Police Department Special Response Team has selected to adopt the new NPA patent pending 130 Grain 300 BLK HELO SR as their primary rifle duty ammunition. Sightmark introduced the Ultra Shot RAM Series sights in dark earth finish. Sightmark will offer three different models with the new finish with the R-, A- and M-Spec. McMillan Fiberglass Stocks is excited to earn Official Stock status of the 2019 National Rifle League season. The 2019 sponsorship as the NRL's Official Stock aligns with several of McMillan's new product initiatives designed to give shooters of all experience levels more options in custom-fit stock platforms. There’s still plenty of winter weather coming, so it’s not too late to pick up some reading material for those wet, cold days. Hopefully these suggestions will be enjoyable, and point you towards other subjects of interest. I’ve said it before, and here it is again: Ready everything by Jeff Cooper. I pulled out The Art Of The Rifle for research on an article in progress. I found myself rereading the entire book. During a conversation with a friend I suggested it to a friend. Later he called to tell me it was “expensive,” and it is. However, you might come across a copy somewhere for cheap. If so pick it up, and get hold of his other works while they are affordable. Affordable is always good. When Gretchen and I travel one of our favorite pastimes is checking out used bookstores. Anytime I find “old” firearms books covering something like revolver/rifle shooting, gunsmithing or building knives I’ll buy it. It’s usually something I’ve never heard of, but it’s “used” pricing. Maybe I’ll only get one or two new ideas from these bargain books – which is worth it – or they’ll mention another book that needs to be purchased. Same principle applies to yard/garage sells. “I’m glad I grew up in a home with no electricity till I was seven and (with) no indoor plumbing, phone or TV till I was sixteen.” So begins Ron Mills’ book Under the Biggest Sky of All. Mr. Mills spent sixty hears packing and outfitting in the Bob Marshall Wilderness. After this much time working in the breathtaking wilderness of the Rockies, dealing with pack animals – often uncooperative – and the human characters involved Mills has some great stories to tell. And he tells them well, in a language that’s simple, yet incredible descriptive and entertaining. A good friend gave me First Freedom by David Harsanyi for Christmas (– thanks Bud). 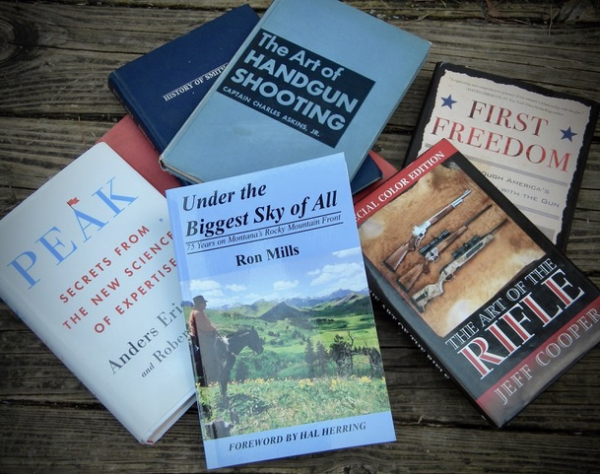 A Ride Through America’s Enduring History with the Gun, is the best book I’ve found covering America’s gun culture. A lot of the material I’ve read before, but not all, and Harsanyi does an excellent job of cover every angle on the history of the U.S. and the firearm, which have been woven tightly together from the very beginning. When I read something interesting in a book I mark the passage and turn down the corner of that page. This one is a real “page turner;” almost every corner is dog-eared, most with multiple areas highlighted. Buy yourself one, and get a couple to give as gifts. One of my instructors turned me onto Peak: Secrets From the New Science of Expertise, by Ericsson and Pool. Ericsson has been studying experts, in a variety of fields, for three decades. “Peak” details the method of becoming great, outlining the mental strategy of creating your optimal performance. And a lot of the principles are counter to the ways people have traditionally thought about performance. If you’re into the mental aspects of training and practice – which you should be – I highly recommend this one. Remember, “reading is fundamental.” We read to study and formulate the threat response. Sometimes reading is just entertaining; a well told story is always appreciated. And reading is a lot better way to spend your time as opposed to surfing social media. Plus, reading a great book is guaranteed to teach you something new. © Copyright 2019 The Tactical Wire. All Rights Reserved. The Tactical Wire in error, or wish to be removed from the mailing list, click here to be removed.